Bus from Shah Alam to Johor Bahru is an important bus service in Shah Alam Bus Terminal. 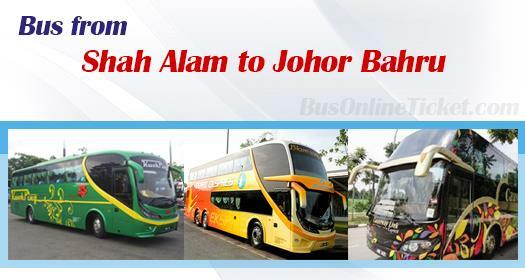 The direct bus service from Shah Alam to Johor Bahru saves the passengers from going to Kuala Lumpur TBS for taking bus. Cepat Sedia Express and Kwok Ping Express are the two bus companies providing frequent departures from Shah Alam to Johor Bahru. Many travel with them because of their frequent schedules. Causeway Link, Maju Express and Eagle Express are the three reputable brands who supplies bus from Shah Alam to Johor Bahru. Even with their lesser daily schedule, they are still the favourite brand among locals because of their reliable and punctual service. The commonality among the bus operators is that they provide spacious VIP bus plying Shah Alam and Johor Bahru. 3-seat-in-a-row VIP coach ensures passengers having comfortable 4-hour journey to Johor Bahru. The bus fare for bus from Shah Alam to Johor Bahru is in the range of RM 36.00 – RM 43.00 per ticket depending on choice of bus operator. Duration required for bus from Shah Alam to Johor Bahru takes about 4 hours. 1 stopover will be provided for washroom break during the journey. The boarding point in Shah Alam is at Shah Alam Bus Terminal located at Shah Alam Seksyen 13, whereas the arrival point in Johor Bahru is at Larkin Bus Terminal. BusOnlineTicket.com offers user-friendly and instant booking experience to online user. Online booking also save the hassle to go down to bus station and queue for bus ticket. Apart from that, with many choices of bus operators and departure times, this makes BusOnlineTicket.com to be one of the most popular online booking portal among its customers throughout these years.